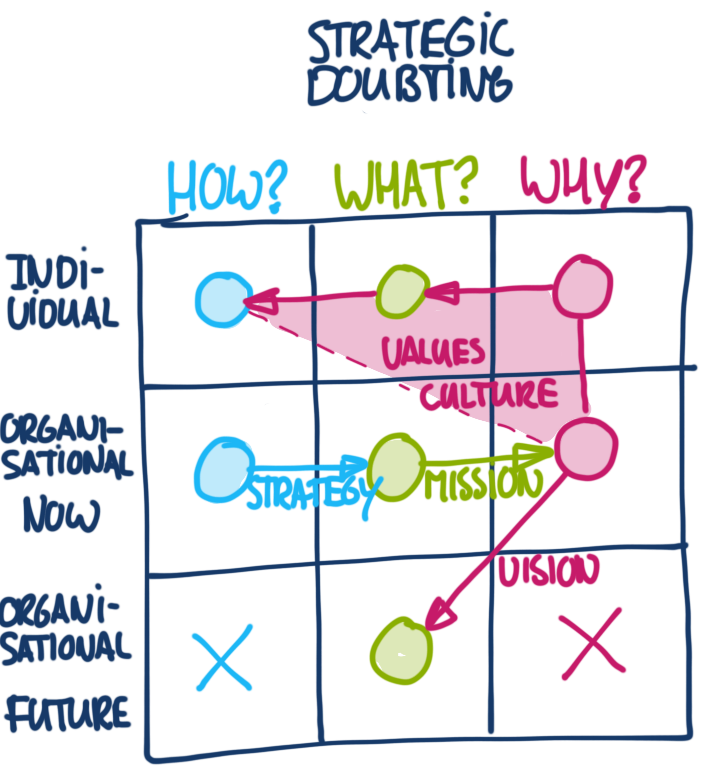 What does strategic doubting look like? Vision Defines the way an organization or enterprise will look in the future. The vision is a long-term view, sometimes describing the organization’s picture of an “ideal world”. For example, a charity working with the poor might have a vision statement which reads “A World without Poverty.” Defines what the company will look like in the future (future what) if it continues to pursue its purpose (why). Mission Defines the fundamental purpose of an organization or an enterprise, succinctly describing why it exists and what it does to achieve its vision.The mission statement provides details of the organization’s operation and says what it does. For example, the charity might provide “job training for the homeless and unemployed”. The statement may also set out a picture of the organization in the future. Defines the company’s purpose (why) and plans/choices (what) to pursue that purpose. Values &Culture Beliefs that are shared among the stakeholders of an organization. Values drive an organization’s culture and priorities and provide a framework in which decisions are made. For example, “Knowledge and skills are the keys to success” or “give a man bread and feed him for a day, but teach him to farm and feed him for life”. These example values may set the priorities of self sufficiency over shelter. Defines (ideally) a set of why’s that all stakeholders of the organisation share and use when making choices (what). All the personal why’s (whether shared or not) add up to a companies culture. Strategy Strategy, narrowly defined, means “the art of the general” (from Greek stratigos). A combination of the ends (goals) for which the firm is striving and the means (policies) by which it is seeking to get there. A strategy is sometimes called a roadmap which is the path chosen to plow towards the end vision. The most important part of implementing the strategy is ensuring the company is going in the right direction which is towards the end vision. Defines the plan (what), the organisation has to reach its vision (why), and the methods (how) it is deploying to implement those plans. Q:Dear reader, what do you think/notice when you look at this picture? I really like the 3×3 matrix – great visual and very succinct! – Vision or Guiding Philosophy (what we want to be) will form Core Values & Beliefs (who we want to be) and Purpose (what we are here for). – Vision/Values/Purpose will shape the Mission (what we want to achieve). – Mission shapes Strategy (how are we going to achieve it). Interesting side note – I found that non-profits tend to have strong Vision/Values/Purpose/Mission but are lacking in Strategy; while businesses are usually all strategy, or try to reverse engineer and have strategy form their mission and vision. I think this is why we see shortermism in companies (focused on quarterly reports). Businesses that fail, especially small corner stores, have none of this down – or have it completely wrong (purpose – make lots of money; mission – retire early; strategy – copy the competition and compete on price by underselling). I think this plays a large part in restaurants having the highest rate of failure out of any business. Glad you like it, and thanks for the vision framework! I couldn’t agree more with your remark about shorttermism (nice word!) and strategy-focus of some companies. This reverse-engineering of strategy to vision and mission is a tricky thing to do. I don’t see how it can be done honestly and feel it’s more a window-dressing excercise to use for marketing. Nothing against marketing, but it should be sincere. I also see this happening in some people, that don’t want to share their ‘true why’, and present a glossy ‘ideal why’ instead. Reputation management and personal branding versus authenticity?